alaTest has collected and analyzed 91 reviews of Panasonic HX-A500E. The average rating for this product is 3.7/5, compared to an average rating of 4.1/5 for other Camcorders for all reviews. People are impressed by the price and size. The reliability and image quality also get good reviews, whereas some have doubts about the zoom and color. We analyzed user and expert ratings, product age and more factors. 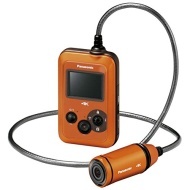 Compared to other Camcorders the Panasonic HX-A500E is awarded an overall alaScore™ of 90/100 = Excellent quality. The Panasonic HX-A500E lays down the gauntlet to GoPro, with capable 4K shooting in a rugged, feature-rich action camera format. Ваша жизнь полна приключений? Вы совершаете подвиги? Ваши дети удивляют и радуют вас каждую минуту? Если да, то как вы обходитесь без видеокамеры? Ведь так многое хочется запечатлеть и показать близким! Panasonic HX-A500 review: wordt 4K met de HX-A500 de nieuwe standaard? Denna nya actionkamera säkrar en imponerande hög videoupplösning i 4K och har en speciell design. I övrigt spöar den sin största konkurrent på två viktiga punkter.